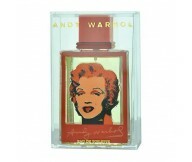 Marilyn Rouge by Andy Warhol is a floral fruity fragrance for women. Marilyn Rouge is a ..
Marilyn Bleu by Andy Warhol is a Oriental fragrance for women. Top notes are floral notes, bl..
Andy Warhol, was an American painter, printmaker and filmmaker famous for being a leading figure in the visual art movement known as pop art. He was born as Andrew Warhola in Pittsburgh, Pennsylvania. The Andy Warhol Museum exists in memory of his life and artwork in his hometown. Designer Andy Warhol has 7 perfumes in our fragrance base. The earliest edition was created in 1999 and the newest is from 2005. Andy Warhol fragrances were made in collaboration with perfumers Dorothee Piot, Olivier Pescheux, Domitille Michalon, Cecile Matton, Michel Almairac and Ilias Ermenidis.